Soon to be a Netflix Original series! The New York Times and USA Today bestselling series, with over two million copies in print! Ever since the monster apocalypse hit town, average thirteen year old Jack Sullivan has been living in his tree house, which he's armed to the teeth with catapults and a moat, not to mention video games and an endless supply of Oreos and Mountain Dew scavenged from abandoned stores. But Jack alone is no match for the hordes of Zombies and Winged Wretches and Vine Thingies, and especially not for the eerily intelligent monster known only as Blarg. So Jack builds a team: his dorky best friend, Quint; the reformed middle school bully, Dirk; Jack's loyal pet monster, Rover; and Jack's crush, June. With their help, Jack is going to slay Blarg, achieve the ultimate Feat of Apocalyptic Success, and be average no longer! Can he do it? Told in a mixture of text and black-and-white illustration, this is the perfect book for any kid who's ever dreamed of starring in his or her own comic book or video game. And then grab the rest of the series, now a New York Times bestseller! 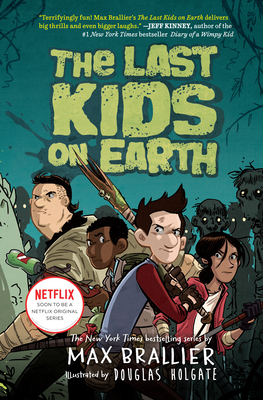 MAX BRALLIER is The New York Times bestselling author of more than twenty books and games, including The Last Kids on Earth series. He writes children's books and adult books, including the pick-your-own-path adventure Can YOU Survive the Zombie Apocalypse? He is the creator and writer of Galactic Hot Dogs and he writes for licensed properties including Adventure Time, Regular Show, and Uncle Grandpa. Under the pen name Jack Chabert, he is the creator and author of the Eerie Elementary series for Scholastic Books. He is a game designer for the crazy fun virtual world Poptropica and does freelance game design for numerous online properties. In the olden days, he worked in the marketing department at St. Martin's Press. Max lives in New York City with his wife, who is way too good for him.